According to Starbucks the holiday season has officially arrived. Here in Los Angeles, however, the temperature reached 97° so I feel entitled to say that I will be easing my way into the holiday deep end. The winter fruit and nut pies beckoning from the cover of this month’s Martha look like artifacts from another world— albeit an inviting one. But our banana bread, which we wrap in holiday ribbons and bows for clients and friends, works for me whatever the weather. Lydia found this recipe in Virginia Willis‘ Bon Appétit Y’All, a serious cookbook with a charmingly light title. After making this bread you’ll probably reach the same conclusion I did: in a time of relentless self-promotion— says the blogger— the ever-gracious Willis buries her own lede. Which would read in this case Exceptional southern chef makes killer food. Virginia is a kitchen warrior, with years of culinary education and experience (many of which were spent with Martha) to prove it. All we needed was one bite of her banana bread. Lydia tweaked this recipe by adding vanilla extract. 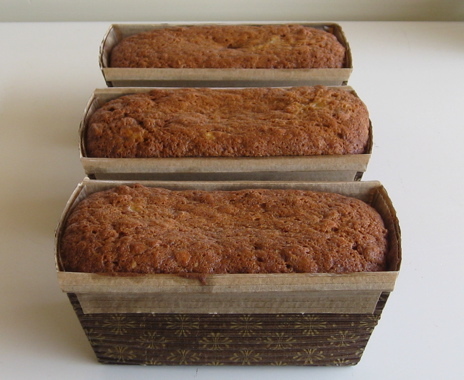 In four years, we’ve never even tried another banana bread. Make this and just try to imagine using a different recipe while the smell of warm, buttery bananas fills your kitchen. In a large bowl, sift together the flour and baking soda. In a separate bowl, cream the salt, butter and sugar until light and fluffy, about 5 minutes. Add the eggs, one by one, beating well after each addition. Add the vanilla and mashed-up banana. Mix until just combined. Fold the wet ingredients into the dry until just combined. Fold in the pecans. Pour the batter into the prepared pan, using a spatula to smooth out the top. Bake until the top is dark golden brown and a skewer inserted in the middle comes out almost clean, about 1-1/4 hours. Cake will keep, wrapped tightly for 4 days. This bread is absolutely delicious!! Thank you so much for this recipe! The first one I made from this recipe was a tad too liquidy (I think it was because I used 3 BIG bananas). What would you recommend to thicken the mix a little when you are at the point that everything is mixed gently together at the end? With a cake I would just add some more flour, but I was afraid of overbeating the banana bread mix if i was to add in more flour right at the end.